To the best of my knowledge, the information presented in this exhibit was accurate as of October 2017. There will undoubtedly be more discoveries, and some of the hypotheses it contains may prove to be inaccurate. The exhibit does not pretend to be comprehensive or complete (there is no such thing), but it does represent the largest compilation of such material presented thus far, and can serve as a reference collection for those collectors who would like to amass their own exhibits on this subject. NKGB (People's Commissariat for State Security, in its first, very brief iteration). Since the clandestine censor marks and censorship-related date stamps did not often appear or disappear with these administrative changes, the various censor mark types can continue from one period to the next. 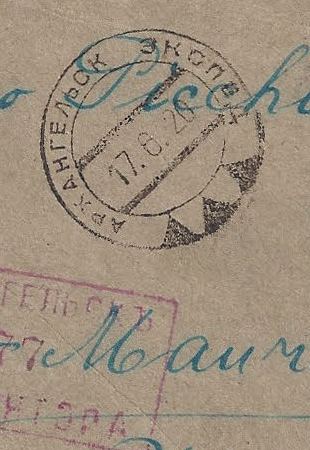 For instance, the "three-triangles" clandestine censor marks are a part of the first three periods, from the Cheka to the OGPU. Due to the large size and copious contents of a few covers, there are eight 11x17" pages in the exhibit, but they are presented separately, by themselves, due to the limitations of the Virtual Gallery program. The reader will be able to tell generally where they would normally go in the exhibit by the header information. SCMS 1917-1941 - and the follow-on exhibit SCMS 1941-1991 - served as the basis for the 2016 book Soviet Clandestine Mail Surveillance, 1917-1991, published by the Collectors Club of Chicago (CCC). The book can be purchased either from the CCC or from the Rossica Society of Russian Philately, available through the Society's website Bookshop.